Description of "Optical Communication Fundamentals"
The liberalization of the Indian economy facilitated the entry of new players in the market along with higher Foreign Direct Investment (FDI) influx and created a huge employment basket. However there was a major knowledge gap vis-a-vis the formal education imparted in engineering colleges and the needs of the industry. This was pronounced by the rapid technological developments in the fields of semiconductor engineering, fiber optic technology as well as computer networks, broadband and telecommunication engineering. Thus most of the telecom technicians/engineers learned the tricks-of-the-trade on the job itself. As a result many of these technicians/engineers as well as managers knew ‘how’ to tackle a problem, but not necessarily ‘why’. Most of the books available in the market provide a mathematical treatise on the subject thus alienating it from the masses. In addition there is no single book that provides the conceptual framework as well as the latest technology offerings in the area of ‘core, ‘backbone’ networks, more commonly referred to as transport networks, and their integration with data networks. This book provides a systematic progression from the legacy networks of the past to the Next Generation Convergent networks of the future. The books aims at providing complete background and relevant details that are required to plan, design and deploy modern day core/backbone telecommunication networks. This is book would be useful to individuals associated with most of the areas of the vast telecom as well as data networking spectrum including planning, engineering, network management & operations, installation and commissioning as well as operations and maintenance, besides any knowledge seeker. This book is the result of my varied exposure of over 17 years in the field of computer hardware, data networking and telecommunications. The book has a unique presentation style that I hope the readers would enjoy. Additional reading sections are included, wherever necessary, so that the reader gets a holistic view of the relevant concepts without diverging from the principal topic. I hope that this book will address diverse needs of all individuals associated with the wonderful world of data and telecommunication networks. This book, which is a part of a three book series, serves as the stepping stone over which the next two books would be based on. The second book would include the architecture, functioning and understanding of the key standards of networks based on Synchronous Digital Hierarchy (SDH) and Synchronous Optical Networks (SONET). The third book would provide an insight to the Next Generation SDH standards and the architecture of the Optical Transport Network (OTN) which has emerged as the transport technology of the future. This book would also unveil the technologies that would shape the architecture of the transmission networks in the future. 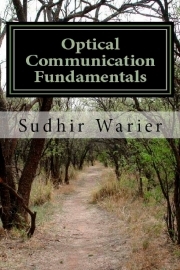 Reviews of "Optical Communication Fundamentals"